At Jileon, we believe that everybody should be able to enjoy the great outdoors and more importantly, splash in puddles. 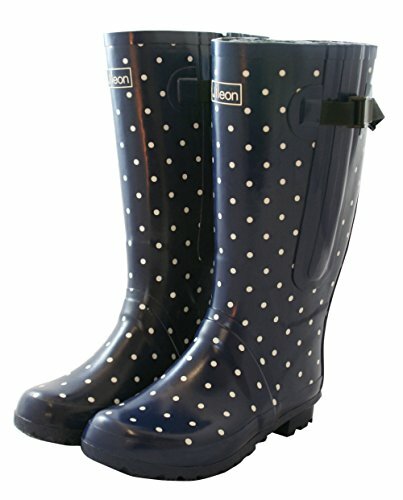 We have designed a range of unique rain boots for women in an effort to address the common issue of uncomfortable fit – Jileon Extra Wide Calf Rain Boots for Women. Rain boots are only as good as the fit they offer. So, we’ve integrated our bespoke double gusset design in these wellies to ensure that they offer the widest available fit in the US. These women’s rain boots fit calf sizes up to 21 inches perfectly, along with extra wide fit in the foot & ankle, and a comfortable height of 14.5 inches (reaching just below the knee). Highly durable, all-weather rubber is used to manufacture these rain boots. A lazy evening stroll, a day at work in your garden, watching the kids at their soccer practice on Sundays or walking your lovely pet dog at the park – rain boots like these can add a touch of class to any & every outdoor occasion. If a touch of flash is your go-to strategy, do be sure to check out our catalog of polka dots or navy spot rain boots. Pick a size that corresponds to your regular shoe size. For in-between sizes, feel free to go one-size-down, as these wellies come up in larger sizes. We offer a limited warranty for 12 months (medium wear) for all orders placed for Jileon Extra Wide Calf Rain Boots for women, making buying these rain boots an easier choice for you. Wait no more – Just click ‘Add to Cart’ to order the comfiest & best-fitting rain boots for women right away! If you have any questions about this product by Jileon, contact us by completing and submitting the form below. If you are looking for a specif part number, please include it with your message.